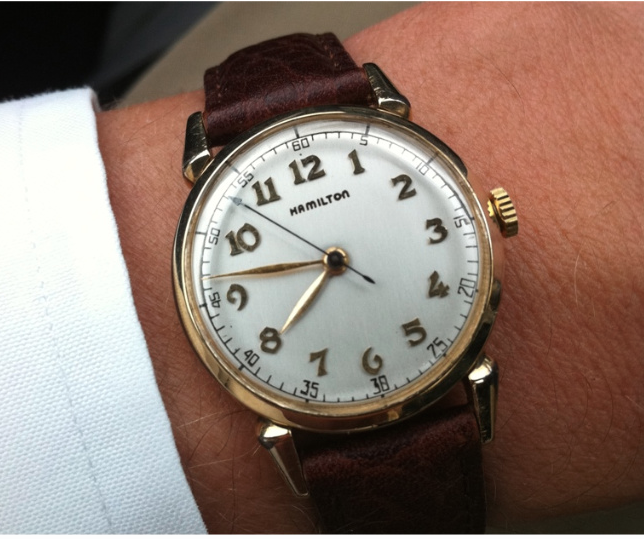 The Secometer B was introduced in 1948 when the 18 jewel, 8/0 sized 748 movement was introduced. 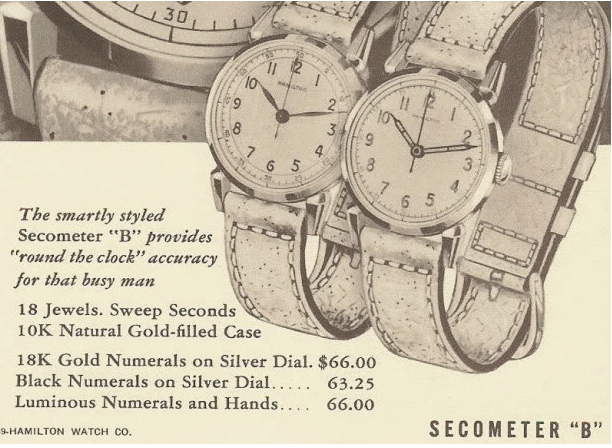 The 1948 model lineup actually featured all three Secometer-models... the original Secometer with the 987S movement, the Secometer B and the Secometer C. The C-model had a solid gold case and slightly different shaped lugs but was otherwise identical to the B. The Secometer B continued to be produced through 1952. 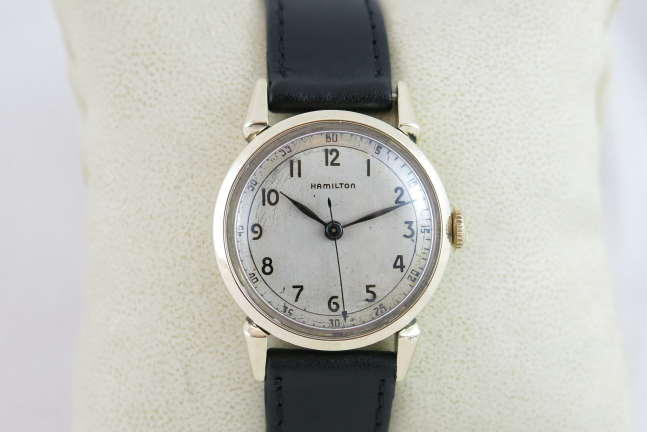 Three different dial and hand arrangements were available - an AGN dial, a luminous dial and a black enamel numeral dial all with hands to match. Unlike the original Secometer, the B model does not "hack" so the movement continues run when the stem is pulled out to set the time. The two-piece case has a bubble back that sits comfortably on the wrist. 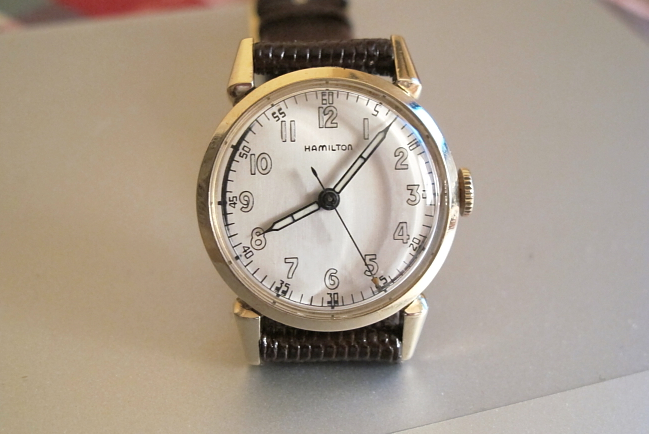 The front bezel holds the crystal and when the assembly is separated, the movement and dial are easily accessed. 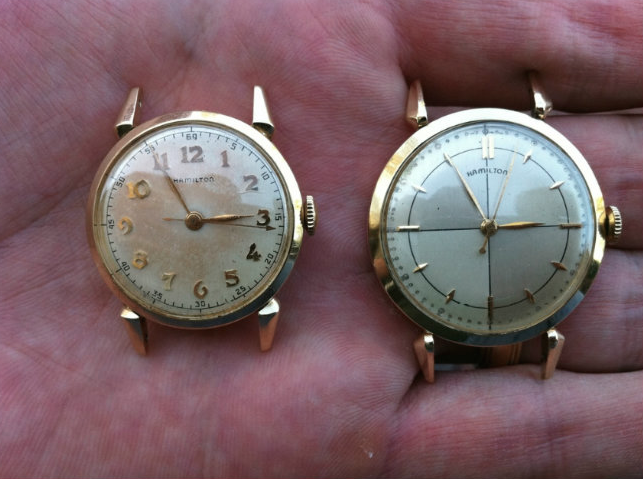 The case tends to wear well but the model is often found with wear-through on the reverse near the crown. The tips of the lugs can also often show the result of years of wear. The Secometer B is easily confused with the Rodney, which was introduced in the mid 1950's. The two look very similar but the Rodney is considerably larger. Here's a side by side comparison of a Rodney and a Secometer B.
I have a Secometer 'C' and 'B'. I've yet to see an original Secometer on the market. Is it worth continuing to look or is the original not up to the standards of the B and C ? The original Secometer is fairly easy to find... do a search on eBay for "Hamilton 987S" and you'll likely find one. The trick is getting one with a nice case, as they are prone to wear through on the top of the lugs. You will often see Endicott dials in a Secometer case too - so worst case is you upgrade cases when you find a nice "Endicometer". There are so many of them though, I personally believe they're a real, uncatalogued, model. I like the original Secometer the best, by the way. I really like the 987S and the fact that it hacks is pretty cool too. So if you have the B and C already, it's definitely worth putting the cherry on top and getting the original. Get a Sentinel too - for good measure.